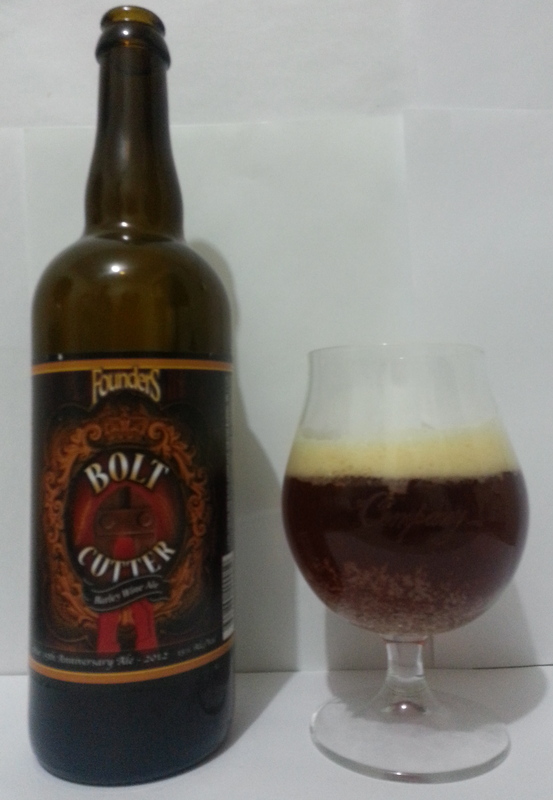 BREWERY’S DESCRIPTION: Bolt Cutter is a cellarable barley wine with an ABV of 15%. Dry-hopped with a mountain of Cascade hops, it’s balanced by a malty sweetness and spicy complexity, resulting from barrel aging some of it in bourbon barrels, some in maple syrup-bourbon barrels and some not at all (standard fermentation only). We’ve allowed the beer to mature in bottles and kegs since July so that it would be perfect for its release next month. Bolt Cutter pours a deep copper color and is best sampled at different temperatures to allow the flavors to unfold. Following in the footsteps of previous Backstage Series beers Bolt Cutter barleywine (15th Anniversary Ale) was a beer that for me presented the following challenge. I had to try my hardest to put aside what I expected the beer to taste like based on the barrel character of previous beers in this serious (e.g. Canadian Breakfast Stout and Curmudgeon’s Better Half). Luckily there were two important brewing techniques used to ensure that Bolt Cutter would stand out; dry hopping and the blending of beer that was aged in bourbon barrels, maple syrup-bourbon barrels and some not at all (standard fermentation only). So with an eagerness to taste characteristics of previous beers and a thirst for innovation I opened the 750ml bottle and got to “work”. Upon pouring the beer into my Founders snifter glass I began to admire its dark copper color (some amber hues), great clarity, and 2 finger off white head. While there wasn’t much carbonation streaming up the middle of the beer, there was a fair amount of medium sized bubbles around the edges and bottom of the glass. In addition, as I drank on the head left a fair amount of lacing on my glass. It was in the aroma that the challenge mentioned above began. After splitting the bottles with my two brothers and taking the above picture, I went in for my first whiff of this special beer. My first reaction was…”maybe I should have kept in the fridge to preserve hop character?” Meaning, I had to really dig for the hints of tropical fruits (citrus) from the Cascade hops and was met with a malt character that at first reminded me of a double IPA whose hop character had started to fade. That malt character included caramel, toffee, graham cracker, and some spiciness that at times is present in bourbon. Looking back on previous Backstage series beers that were aged in maple syrup bourbon barrels (e.g. CBS), I was surprised not to pick up much vanilla, coconut, or apparent oak in the aroma. Though I should note that as I sipped the beer and pondered the thought that went into this beer I was able to appreciate and enjoy the aroma and its complexities a bit more. As with most higher ABV beers the initial taste (flavor profile) of this beer was quite similar to aroma. The malts shined with the bready / graham cracker notes preventing the caramel and toffee flavors from becoming too sweet. At times I picked up some oak and spiciness at mid palate before being met with some sweet citrus and dark fruit notes in the finish. As in the aroma the lack of the hops and barrel character as prominent flavors worried me a bit and at times a tone of apprehension for what the beer would taste like as it warmed up set in. However, as the beer warmed up I put aside my preconceived expectations and enjoyed the complex caramel and toffee malt character that blended with a spicy-somewhat woody oak flavor and some citrus and dark fruit. This led me to conclude that the blending of the two types of barrels with a portion that was not barrel aged allowed the base barleywine to shine and be accented by the sweetness and spiciness from the bourbon barrels rather than vanilla etc (typical of bourbon barrel aged beers). At 15% ABV Bolt Cutter had a smooth medium body which hid the alcohol quite well and made it only noticeable in the form of some heat felt in my chest after each sip. Rating this beer was a bit difficult, but in the end I chose to focus on the following three factors. Because this beer represents the 15 year history of Founders Brewing Company it was successful in blending new (barrel aging) and old (authentic to style) flavors. Next, it had a unique malt complexity the and its ABV was hidden quite well. Lastly, due to the hop character tasting a bit faded I most likely did not taste the full potential of this beer. Hence, I chose give Bolt Cutter an 8/10 (at times thought of giving it a 7.5). My recommendation is to buy two bottles, one to drink fresh and the other to age. I am curious to see how the malt character of this beer will develop over time. Cheers and Happy Anniversary to Founders Brewing Company!!! This entry was posted in Beer Reviews and tagged 15 anniversary ale, 15% ABV, Bolt Cutter, Bolt Cutter Barleywine, craft beer, Dave Engbers, English Barleywine, Founders Brewing Company, Grand Rapids, limited release beer. Bookmark the permalink.